With RealVNC remote access software we have been able to provide a more responsive helpdesk, positively impacting on staff morale throughout an organization where providing excellent care is key. Calderstones NHS Trust provides highly skilled, specialist care for patients with learning disabilities in facilities throughout the North West of England. With various buildings spanning around 100 miles in total, the small IT team have 1600 staff in the organization relying on them for IT helpdesk support. 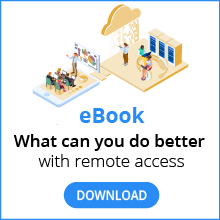 By deploying RealVNC remote access software with an Enterprise license across all computers, technicians can remotely troubleshoot and resolve IT issues quickly and efficiently. Off-site travel costs and downtime are reduced, resulting in happier staff providing the highest level of care to their patients. Responsible for a total of 1600 staff across large headquarters and wide spread community houses in the North West of England, the technical support team at Calderstones NHS Trust required a solution that would enable them to solve IT problems efficiently. System downtime had to be kept to a minimum in order to reduce the disruption caused to the specialist care staff provide. Installing remote access software would enable IT staff to access any computer across the region to troubleshoot and resolve problems without leaving their desks. Calderstones NHS Trust deployed RealVNC remote access software with an Enterprise license to all computers throughout the organization. Now, whether they are located in one of the 10 buildings at headquarters, or in the 60 community houses in the region, staff receive a quick, effective level of IT support from the technical team. With printer problems, issues with computer programs and troubleshooting now performed remotely, technicians no longer have to travel up to an hour to fix issues. This reduced travel means there is always someone in the office to answer helpdesk calls, ensuring problems are dealt with as they arise. Staff also use the chat facility as a training tool. Now with IT Technicians able to explain how the problem is being resolved, staff can correct the issue themselves should it occur in the future. Calderstones NHS Trust chose RealVNC software with an Enterprise license because of its easy-to-use interface and high level of encryption, essential when patient information is stored on the computer system. Use of the deployment tool also meant that RealVNC software was installed quickly and easily across all computers. The additional premium features available with an Enterprise license further adds to the support the IT team provides. Increased productivity of IT technicians and lower off-site costs, resulting in happier staff providing effective patient care.